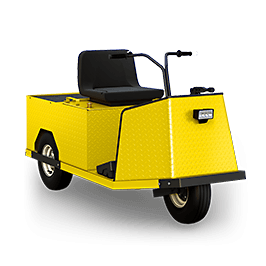 The MP-240 is an economic and cost-effective vehicle that can adapt to any industry. It’s narrow and maneuverable enough to fit through door openings, but tough enough to withstand years of abuse. It’ll move you and your stock three times faster than on foot, quickly boosting operational productivity. Features include under-seat battery compartment, low-step entry, and front and lateral protection bars. Optional lift-out battery box and fold-down back seat. A multi-purpose vehicle offering great value and day-to-day reliability. Accessories: Bolt-on bumpers and rear wheel guards, 24V accessories to equalize cells and extend battery life. Body: 14-G diamond-plate steel body, tubular frame, powder coating.